allows a user to produce more of it and for a body influencing ability, it should enhance the user's manipulation of his body. This kinda doesn't sit well with the idea of awakened users in impel down but the data overall is still not complete. The rule: Awakening improves what it already does by increasing what it fundamentally does inherently improves any ability. Enhanced Durability, recovery, toughness; a boost in physical attributes. What do Zoan abilities do in general prior to Awakening? They generally improve physical abilities. The correlation is consistent there. Awakening just improved what it already endowed the user with. The only way this rule wouldn't be consistent with the ID Zoans is if it did something that Zoan abilities didn't improve. Like if it suddenly allowed the user to produce Ice when it's a regular Zoan ability, then that'd be an inconsistency, but it's improving physical qualities which is something that Zoans gain initially and prior to Awakening. It works out. I wouldn't so much say the data is incomplete given that it checks out with all known Awakenings so far, I'd say it's more a case of needing more samples to see if the consistency remains. Once an Awakening contradicts the rule, then I guess that would be more data that we can derive more accurate information from. While I could be biased, in trying to be as objective as possible, it seems consistent so far. Not to blow my own trumpet, but this rule was something I wrote about prior to Katakuri and Gild Tesoro's Awakening being revealed. If anyone had used this rationale or theory to predict their Awakenings, they'd have been accurate. Question now is if it will accurately predict Luffy's Awakening or if Oda simply confirms it in dialogue. nullifies that ability or rather in some ways can be used to counter and rebound the attack. This can also be used in other attacks as well. That would make a awakened gomu gomu(fully elastic/ stretchable) ability highly versatile and useful against a number of users. Maybe there can be a number of uses of the ability with the haki on and top of the gears which we have already seen( could be enhancements of the gears as well). Another point to this sort of awakening would be it's durability in case of loss of haki. Awakened gomu gomu would be a much better version of gomu gomu where most attacks would not only not hurt the user but can be used to rebound the attack with the strength of the attack. While the idea/rule is simple, it's extremely effective. As you pointed out, on top of increasing stretching, increasing the durability of his rubber body would make him significantly more powerful. Not only will he be more resistant to any form of damage, he'd probably pack a lot more power too. I don't know if Awakening increases every fundamental aspect of an ability, but if it does, then this might be literally what we're going to see. It might even be the case. It would make Luffy extremely powerful. On another note, I don't know if people noticed Queen's statement here. Could it be that Queen has Future Sight too? He's confident in Luffy's ability to survive. Maybe he's estimated that Luffy could defeat all his men. He just intends to defeat him himself which could explain why he's rather cheerful despite the fact all his men are being defeated. Given he is a theatrical character, he might simply want to make a showing of his own power by defeating Luffy in the end and stealing the lime-light after he supposedly runs through all his henchmen. Quite possible he's just perceptive about Luffy's strength and has nothing to do with FS. It still wouldn't be surprising for a Yonko's commander to have FS at this point. Or Queen just wants to eat and finish ihs dessert before the battle. He's literally feeding him fodder with the intention to take him down easily. The real question is will he run out of the dessert before Big Mama arrives? That'll probably put her in hunger pangs and release all prisoners. I need to read the arc again from the beginning, I want to see if I can get some sort o grasp of the whole thing. What role does Oda really have for Big Mom ultimately? Also, thinking about it, Big Mom's ship is at the entrance of Wano... Nekomamushi and co. are yet to arrive. Wouldn't that mean they'd likely run into them? The real question you're asking is how do you know if a power has already reached it's limit? The reality is that you can't know that arbitrarily. You can only deduce if the information is given. Yes, exactly. Glad we are in the same page here. We already know based on the Awakened characters the rule that governs Awakens. We don't really need to know if a power is Awakened, we don't even need to know class. It also doesn't matter about class, this is where terminology is irrelevant. All that matters is what the ability does. Class doesn't determine how an ability Awakens. If Zoan ability allowed a user to produce something to manipulate, they'd possibly affect their surroundings too. It has nothing to do with class fundamentally. That Oda most likely feels is graphically appealing to transmute the surroundings into. Otherwise, it wouldn't be transmuted, the character would simply have the power to produce more of said object through their body, e.g. Can't turn buildings into Fire, he however can just have Ace/Sabo produe more fire from their bodies than they could produce before Awakening. The idea that Katakuri was unable to produce Mochi initially is something that doesn't make sense because all the Awakenings we've seen never added new abilities, so it's highly unlikely that Luffy would suddenly be able to do something he couldn't originally do. You'd really need evidence of a character that was able to fundamentally do something Awakened that they couldn't do prior to Awakening. In other words, a new skill. Assuming you could provide evidence for such an instance, then we'd have to entertain the possibility that Awakening can fundamentally add a new skill to an ability, and thus far, there's no evidence of that if we look at all the known examples. Gild Tesoro's range increased from Awakening meaning before Awakening, the range was lesser, nothing fundamentally changed about his DF after Awakening. No new skill added or taken away. It's just the same power with a greater capacity. If Gild Tesoro's ability had a range of 10 kms prior to Awakening, Awakening may have increased that to 100 kms. For the ID Zoans, they got more enhancement physically meaning prior to Awakening, they were not as physically enhanced. If they physically had a Doriki value of 50,000, Awakening would increase that to maybe 150,00 or 200,000 or more. Just arbitrary figures, but the point should be somewhat clear. All Awakening is, is the full powers of an ability expressed or unlocked. Awakening is simply increasing an ability's capacity. If put mathematically, if the the number 2 was going to Awaken, it only has to be increased from 2 to a higher number; 2 becoming 4 could essentially be an Awakening if 4 is the limit as to how much an ability can improve optimally, then 4 is Awakening in this instance. Awakening as far as we have evidence-wise does nothing to fundamentally change an ability. If an ability only produces, then Awakening won't change that. If an ability manipulates, Awakening won't change that. Yea, i am not so sure about everything either reading the arc weekly, but Big Mama and Queen will have to clash. The fact that Linlin is after Oshiruko and that Queen is eating the exact same dessert would mean the plot demands them to cross paths. Now if Queen is done finishing his Oshiruko by the time Mama gets there, then her hunger pangs can start.... But her vs Queen will most likely happen. Regarding your awakening comment, since there's so little declared in the manga, a lot of what you say becomes highly likely rather than surely....... Gild Tesoro is afterall a non-canon character. Also, wouldn't it be nice to discuss that in a thread? About ID awakened users, wasn't it said that they can never revert back to their original form? I might be mistaken but if it is true then the awakened users loose out on their original form. I could argue in some cases or situations where this would turn out to not be an enhancement of their overall ability/ resourcefulness. On the other hand, your theory would still hold that their DF ability itself was definitely enhanced. This was my point on regarding ID awakened users. Simply whether sometimes you lose some aspects of your abilities beforehand while you gain awakened abilities, especially in Zoan cases. Non-canon, I acknowledged that. My point is the rule has stayed consistent in both the actual Manga and the Movie. As to whether it's likely or surely regarding Awakening, I guess it depends on what the information means to you. A character hits something and shatters their bones in the process; another scene, a character simply says something is extremely hard; is there any difference between what is being conveyed here? One is illustration while the other is explicitly stating something, both say the exact same thing in their own way. There's no other way to interpret the information about it being hard unless there's a piece of information that forces us to see otherwise. To me, if something implies something to such a great degree. then it's as good as being told that thing is extremely hard. The way I see a character bleeding, I don't need to be told said character is injured, it just seems obvious; things don't need to be explicitly stated to be true, they just need to be at the very least strongly implied. Things don't need to be explicitly stated to be saying something that can nigh be factually accepted, they just need to be conveyed well and I feel Oda does a good job of that. While there isn't much detail given yet about Awakening in the series, a lot of information can still be gleaned just be reading everything the Manga has said and shown. What is shown seems to be taken less seriously than what is said despite the fact it can also give crucial information. I didn't really develop the theory based on feeling or intuition, was more reading what the Manga said and showed for the most part and then analysing it all to explain what was observed. Ultimately, It depends on how confident you are assuming you're analysing information with the goal of objectivity, and not personal feelings or wishes or because you think an idea would be cool. None of those should be factors, it should be what is the information I have, what can I extrapolate from this information, can I find any trends with all the information I have and if so, when I do believe I find a trend, can I explain known problems with my theory/hypothesis and if so, can I test it to predict other things? If it's there, I have no reason to doubt my findings at the moment until there's a contradiction. For now, based on the consistency of the theory, I think it's accurate. Until evidence shows otherwise or there's a better explanation, I personally feel confident in this theory being accurate. Not because it's mine, but because it's a theory that is currently working. I don't think it was ever stated that they can't return to their forms. This is all based on the presumption that the puzzle was found at the Banquet in Komurosaki's apparent demise. If this is a 100% the setting in which the Puzzle was found, to those who are 100% certain that Kyoshiro is an ally and didn't show the puzzle in order to maintain the idea Komurosaki and Hiyori are the same people, the conclusion still doesn't bode well even if we give him the benefit of the doubt that he didn't show the puzzle to Orochi. How exactly? Well, we only saw Kyoshiro see the puzzle, doesn't necessarily mean he gave it to Orochi. If we however give him the benefit of the doubt as not being the one to show Orochi the puzzle, the scenario could be such that the explosion from Nami's tempo blew the puzzle out of Komurosaki's hands and then Orochi or one of the Oniwaban saw it. The issue here with the idea Komurosaki and Hiyori are the same people is... Hiyori has a puzzle when she shouldn't have one since it'd have been out of her hands in this scenario. It must therefore mean Hiyori and Komurosaki are different people. So, in a sense based on this scene alone, whether Kyoshiro is the culprit in revealing the puzzle or not, we're still led to believe they're different people. At this point, the issue is no longer if Kyoshiro is an ally or even relevant, the real issue is how does "Komurosaki" who is apparently Hiyori still possess a puzzle that was supposedly confiscated from her by anyone at the banquet? Unless the puzzle wasn't discovered at the banquet, then the only way to really be certain that Komurosaki is definitely Hiyori is to find someone in a setting before the Banquet that revealed the puzzle. Why before the banquet is a criteria is because the plan was secure up until the banquet took place. There are just so many discrepancies with the idea they're the same person. I will however wait for more information. Wano has been a pretty complicated arc, so easy to miss hints and dynamics. He would show it so that Luffy would think back on it and try to replicate it. That is exactly what Luffy is doing now. 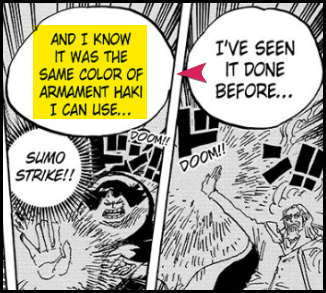 The only thing Hyo did was say that Haki is a foreign concept, but it's similar to the invisible thing they can imbue into weapons here in Wano; this just means Haki is called a different thing in Wano. That is more or less Haki. More so. Luffy said it was the same Armament he's always used. Not a new form of Armament. It's just a technique that can be performed with or without Haki and with or without Swords. The thing that really gives it away as being a technique is where he says this: A good Sword will cut steel when you want it to do so or not even cut paper despite slashing at it. Haki doesn't do that. nor has it ever been described as doing such. It seems to be just a technique. A theory can only really be accurate if it explains everything consistently. If it doesn't, then it means it's flawed. Theories are imo like algebra, if the pattern doesn't follow the rule (theory), then the rule (theory) is wrong. What you're saying is it changes an ability. Prior to Awakening, you say Katakuri didn't produce Mochi whereas after Awakening, he started to produce Mochi. That does contradict what we know about Awakening. Joker would likely have always been producing strings, he doesn't turn into strings either. He'd need to be able to turn into strings and produce them for your theory to have credence that Awakening added one of the additional skills. What you're implying here is that Awakening fundamentally adds further abilities to an ability when there's really no evidence for that. If we also go with the Gild Tesoro film, it contradicts the idea too. It says Awakening just increased his range, not give him new abilities. It's more likely Katakuri has always been producing and turning into Mochi; prior to Awakening, he probably couldn't produce as much Mochi as he does now which he can only do now thanks to transmuting his ability into his surroundings. He also couldn't be a Logia whether or not he could or couldn't turn into Mochi. Logias are just natural based DF power types that allow intangibility. Mochi is not a force of nature or related to such. The only logical theory that makes sense at this point is Awakening simply enhances what a DF does already, not add new abilities. It's the only rule that explains and actually improves any DF. I could arbitrarily come up with a DF and explaining how it'd Awaken would be straight forward. The rule that Awakening adds another ability to the DF is not a consistent rule or theory as we have Awakened uses who have no new skills and none that have been shown or indicated to have lacked a skill in the first place. I get the whole thing that Hyo said, referencing the breath of all things, but as I think back on it, I think BOAT is just yet another description of Haki. I need to double check, but Raleigh said something about how haki is in all living beings in the world. BOAT seems to be an extension of this. Sorta like you can control your haki to the point that it can push away something elses haki, or living energy, instead of cutting through it. 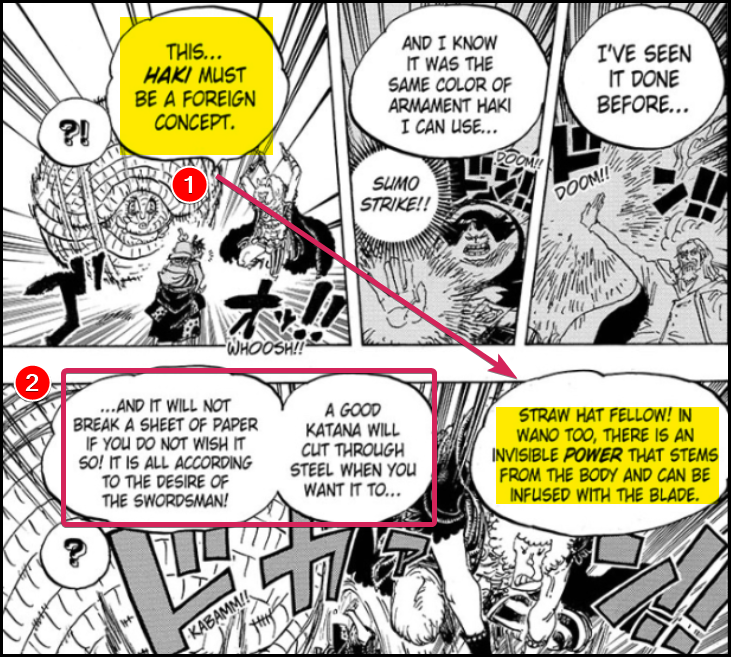 I just don't see how one new bit of evidence, assuming BOAT is what Hyo is talking about AND it is separate from haki, makes sense with Raleigh telling Luffy about haki, and shows him a technique that isn't a haki technique. It just doesn't mesh. So Kawamatsu is the mystery retainer. The confusion is my fault. When Kinemon, spoke about the three Samurai he needed, three sillhouettes were shown. And one chapter later we were shown two sillhouettes (Ashura and Denjiro) fighting Kaido, not three. I somehow confused Kaidos beard for a Samurai or something. The reason why people believe Hyori = Komurasaki is because they look the same and Komurasaki has to be important, a Volume title was dedicated to her. There was a map that some scanlators for some reason chose not to add to their releases that showed that Hyori was Komurasaki by name, before revealing it as Hyori that is. I always thought that doflamingo's strings came from out of his body. When he was defending against luffy's boundman, they came from the ground beneath no? And he was up in the air at that time. 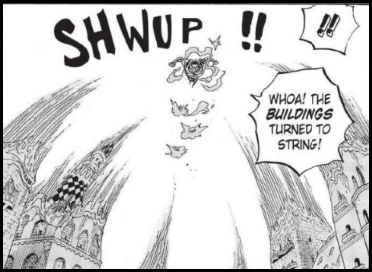 So is Sengoku's shockwave thing an example of this advanced haki as well? Simplicity is the ultimate sophistication, Da Vinci is trying to tell you sth, all your posts are full of 87346782348 meaningless lines. You try to put your baseless thoughts as if they are facts. With no backing/supporting evidence from manga. You need to read One Piece. Whatever you are reading is not One Piece. Then old man Hyogoro shows what he calls Goken(Advanced Armament Haki) and asks Luffy if it is the same thing he is looking for. After that Luffy cries in joy, saying it is the thing he has been trying. Answer me now, in that page Rayleigh is showing Goken / Advanced Armament Haki while teaching Luffy armament haki. You remember it right? Do I need to put another link to that Chapter as well? Why would Rayleigh show Luffy Goken/Advanced Armament Haki if what he is trying to teach is haki? It is because Goken is Advanced form of Armament Haki. I know it is hard for you to handle Luffy needs so much teaching on the matter, but some1 used it somewhat unintentionally 15 years ago. Yet, this is how Oda showed his audience Advanced Armament Haki, Deal with it. His strings are nearly invisible most of the time, so we can’t say they aren’t coming from his body, especially when it is close-ish range, however he was awakened as well so he could have been pulling them from just about anywhere. 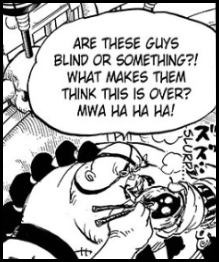 The key thing to what I was talking about was Doflamingo himself saying he was able to use his devil fruit to effect things other than his own body after awakening. Hadn’t thought of that! I had always assumed it was just an ability of his devil fruit, since he was a bodhistava, if I remember right, but if that was this same haki, it’s a damn sight stronger than all the other users! Who hurt you, my dude? I get the whole thing that Hyo said, referencing the breath of all things, but as I think back on it, I think BOAT is just yet another description of Haki. BOAT was never said to be another description of Haki nor implied to be. It's only been stated to be a technique. Rayleigh also said humans have Haki dormant in them. It's a matter of talent that determines whether they unlock it, how fast they can hone it and how strong they can get with it. It was never said it allows the Devil fruit to affect more than the body, it said in rare instances, it does that meaning 9/10 times, it wouldn't affect the surroundings. It's highly unlike that Whitebeard, Marco, Jozu and such characters are not awakened, yet it's not like they affected their surroundings. Highly unlikely that Joker, ID Zoans and Katakuri are the only awakened. It's also not a new ability in the sense that it has an arbitrarily different function, it's still fundamentally the same thing. It's just production at the end of the day; this is just a fact. You'd have to prove that Katakuri or Joker turning things into their DF wasn't fundamentally to produce more of their power to manipulate and the images say otherwise, it's solely for manipulating more of their power. Production is achieved by transmutation, it's not fundamentally a new skill that has a new purpose. The purpose of the fruit remains static, it's simply just enhanced. It's not like Joker and Katakuri were initially able to only produce and manipulate, then Awakened to suddenly possess a new ability to create and manipulate Ice or new substances or perform telekinesis on anything, if that were the case, your argument would have some ground and basis, but there's no such evidence to give the idea credence. It simply is fundamentally doing what it initially did. Produce to Manipulate. It also has absolutely nothing to do with class either based on evidence, otherwise all Paramecias would have the same type of Awakening; you'd need evidence to prove otherwise as your statement is contrary to what is observed. We have character like Jozu who do not affect their surrounding. The idea that Jozu wound't be Awakened would be like questioning if Jozu was a Haki user, some things are just to be expected of characters of a high calibre. It also doesn't translate well, the idea all Paramecia Awakenings would affect the surroundings. How exactly does Whitebeard whose power translate? Can't turn things into tremor, can only make things tremor. Yet it's a Paramecia. Fujitora controls Gravity; how does one turn the surroundings into gravity? The idea simply isn't feasible nor does it make sense. Therefore, it couldn't be the rule, and the Manga never ever said Awakenings affect surroundings, it actually said it was rare. Luffy's logical progression isn't to convert anything, he never produced or manipulated fundamentally to begin with. He fundamentally just stretches. Therefore, the consistent progression cannot be anything to do with production because the evidence simply doesn't support. Like I said before, it contradicts everything we currently have regarding Awakened characters and progressions thus far. Facts and Observations don't change just because we don't particularly like them. What you're really saying here is you'd prefer more to Awakening than has seen, but that doesn't mean it doesn't work the way that it's currently been shown to work. Preference and how things work are not mutually exclusive. So did I because I thought Haki could only be imbued one was physically in contact with. However, turns out one just has to be connected to something even if it's just telepathically. Can call it baseless or claim I don't back my statements with evidence if you want, that's your opinion and you're entitled to such ideas. However, the irony here is pretty staggering. Most people attribute Awakening to be a super complex mechanism whereas a simple rule such as: Simply enhance what's present is a simple rule that explains Awakening. Awakening as we've seen has been a very effective power, yet it's being governed by a simple rule. Things don't necessarily have to be complex to be powerful or useful or have a great or profound effect. Of all the quotes you could use to criticise, you used one that more or less adheres to what I'm saying. I can only guess you couldn't understand it, but that's fine. Nope, I read the Viz, the official translation. Critical things in the Jaimini and Mangastream had to be corrected not just by Viz, but other translators confirmed they got some of their phrases incorrect. Mangastream had it written a lot more accurately. Goken also doesn't mean Advanced Armament, mind you. If you actually did some looking into, it actually means Mighty Blade. Might Blade is not a form of Haki, it's simply intent given what we've been observed. At no point was it stated to be Haki. If you also read the Viz properly, Luffy says it's the same Haki that he's using that Sentomaru and Rayleigh used whilst performing this technique. So, no, it's not an advanced form of Haki, it's the same Haki. 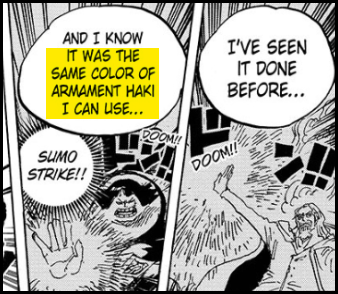 It's simply just a technique that can be used with or without Haki. As for why Rayleigh showed him this manoeuvre, well, if we apply this ode of simplicity you were singing at the start of your post. As something that Luffy would remember and try to emulate in future once he'd exhausted everything he was capable of. He's come against Kaido, he's hit a proverbial wall, he's rummaged his mind to find all the solutions he could use to defeat his current problem, and now, he's remember Rayleigh. Think it's pretty self explanatory. No so sure what your hostility issues are, but I hope you get it fixed and have a pleasant meal sometime in the day. It is possible that both BOAT and VOAT are similar things or even the same thing and I again go back to my new understanding of Haki being energy. If it is a different thing then the characters interact with VOAT through CoO and with BOAT through CoA. If it is the same thing then just depends if a character is able to interact with it through CoO or CoA. There seem to be different ranks of mastery as Momo is able to hear and give commands to Zunisha while Luffy is only able to hear. Zoro who was able to hear a breath of everything in Alabasta couldn't either hear nor command Zunisha. Can't say for sure, just guessing. Maybe it's the same thing, the energy since Zoro hears the breath but to interact(cut) with it, it's doable through CoA focus and release of energy(Haki). Also, we should question what information did Zoro get from hearing the breath of Mr.1's steel. Roger couldn't read poneglyphs but through CoO(i guess) he was able to read the energy of the poneglyph. That would be cool. Though a rubber staff would seem like a gag at best, lol. "This metal staff is now...rubber?" Yeah, I theorized about it too since it would help him a lot against other combatants with weapons but in the end, it's same conclusion - too late for it and hardly fitting his combat style. Also, I think that Oda gave that aspect of Monkey King to Nami, she always had a staff.